Severe poverty is one of the greatest moral challenges of our times. But what place, if any, do ethical thinking and questions of global justice have in the policies and practice of international organizations? 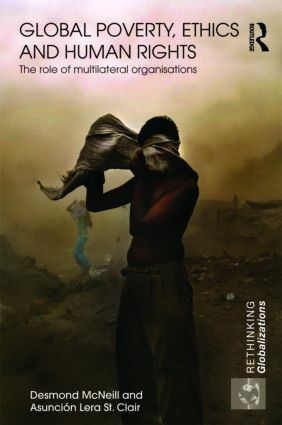 This books examines this question in depth, based on an analysis of the two major multilateral development organizations - the World Bank and the UNDP - and two specific initiatives where poverty and ethics or human rights have been explicitly in focus: in the Inter-American Development Bank and UNESCO. The current development aid framework may be seen as seeking to make globalization work for the poor; and multilateral organizations such as these are powerful global actors, whether by virtue of their financial resources, or in their role as global norm-setting bodies and as sources of hegemonic knowledge about poverty. Drawing on their backgrounds in political economy, ethics and sociology of knowledge, as well as their inside knowledge of some of the case studies, the authors show how, despite the rhetoric, issues of ethics and human rights have – for very varying reasons and in differing ways – been effectively prevented from impinging on actual practice. Global Poverty, Ethics and Human Rights will be of interest to researchers and advanced students, as well as practitioners and activists, in the fields of international relations, development studies, and international political economy. It will also be of relevance for political philosophy, human rights, development ethics and applied ethics more generally.